Online Survey and Design Review Area D, UEL: How can we make Area D a better place to live, work and play? Take the online survey from March 7 – 31, 2019. All are welcome! Refreshments will be provided at the evening events. All Design Review Events will have the same content – you don’t need to attend all! How can we make Area D a better place to live, work and play? Area D, often referred to as ‘the Village’, is home to a diversity of people and places. It is a community that features a range of multi-family housing, shops, restaurants, transportation options, and parks and green space. We are developing a neighbourhood plan to ensure that any future growth in Area D meets the needs of the community and we need your help! 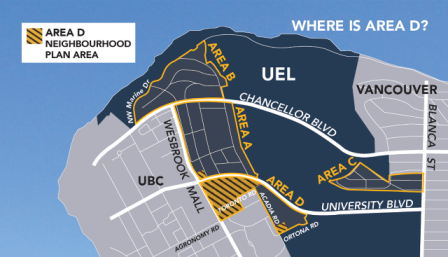 A Neighbourhood Plan is a strategic plan that will be used by the UEL Administration to make decisions about Area D land use, infrastructure investment and community priorities. The Plan will outline a community vision for the future, with supporting goals and objectives, and a policy framework to guide future growth and development.